Defender Dominic Ball has returned to Aberdeen on a season-long loan from Rotherham United. Ball, 22, who can play at centre-half or right-back, made 19 appearances on loan at Pittodrie last term. 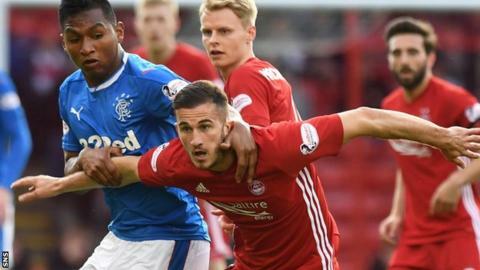 He played the final five games of the season as the Dons secured second spot in the Scottish Premiership. "He showed exactly what he is capable of when he played a vital role in our post-split games during which we were undefeated," said McInnes. Ball began his career with Premier League side Tottenham Hotspur, and spent time on loan at Cambridge United and Rangers, before signing a three-year deal with Rotherham in August 2016. He also had a six-month loan stint with Peterborough United. Ball told Aberdeen's Red TV: "The end to the season, I think everyone here really enjoyed it. We deserved it in the end. "That was another reason for me wanting to come back up, to carry that on. Carry on the level of performance, that winning mentality that we all had as a group of players. "It's important that we still have that core of the team that did win those games to secure second place. We all know what's required, we all know the type of players that we are."